Today I was on my way to another close by favourite brunch spot of mine and passed by MONKI, so I decided to see if it could compete with the rest of the fabulous restaurants in Connaught. 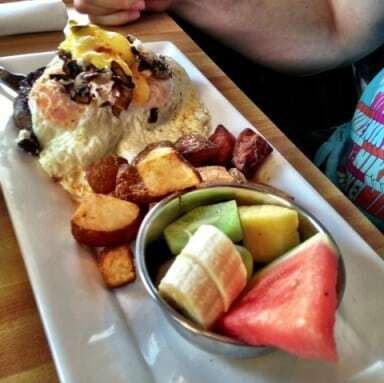 Located on the corner of 12th Street and 10th Avenue SW, MONKI Breakfastclub & Bistro is another inner city restaurant that does breakfast and brunch very well. Entering MONKI we were seated at a low table against the wall with half booth and half chaired seating. Our server immediately took our drink orders and provided us with menus. After settling in, I noticed the cafe style open kitchen with the menu items written above on chalk boards and also noticed the variety of high and low tables available for dining. All in all, the restaurant ambiance was very comfortable with natural colours that make you want to eat some brunch! The walls remind me of hash browns! 6 ounce steak, two eggs and sautéed mushrooms served with hash browns and a bowl of fruit – this protein packed dish didn’t disappoint at all. The steak was very tender, while the sautéed mushrooms and sunny side up eggs cooked to perfection make this dish a top contender for re-try menu items the next time I come back. Capicollo Eggs Benedict – Eggs Benedict with pesto and tomatoes topped with hollandaise sauce served with hash browns and a bowl of fruit – I found the eggs Benedict to be a bit small for my liking, but their exemplary taste made it alright! The capicollo has just the right spiciness to it, while the hollandaise sauce is thick and creamy and is to die for! I had to soak up every last bit of it with my hash browns, which were crispy and delightful themselves; not too hard, not too soft. On top of the great menu items, the coffee and fruit were also just as delicious! Props to MONKI for delivering great tasting food with great service! 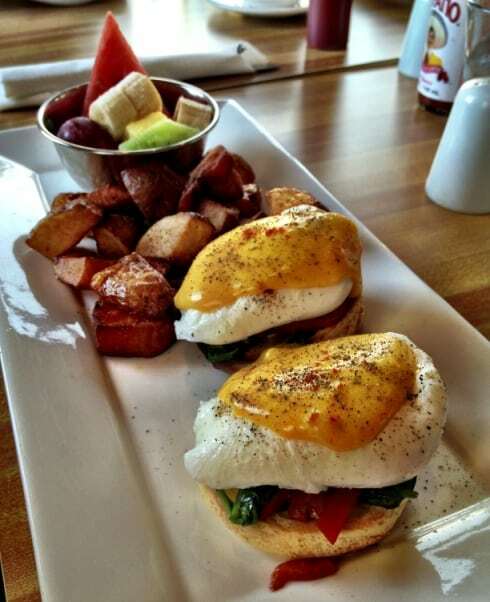 If you are close to MONKI Breakfastclub & Bistro, I recommend hitting it up for some of the best breakfast in Calgary! Hi, How can you get hold of MONKI – they never answer their phone?